I am completely dumb-founded, my eyes have not stopped seeing my ears in Imo State since Friday 17th August 2018, as the men of the Nigerian security forces display again their murderous and genocidal prowess, this time against the very wombs that carried them for good nine months without exposing them to any risk of extermination through abortion. This is quite unbelievable. 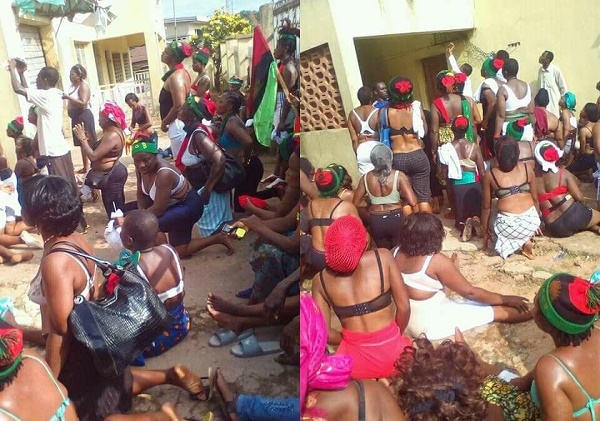 On Friday 17th August 2018, the Mothers in BIAFRA land came out en masse to protest against the unlawful arrest and illegal detention of their son Onyendu Mazi Nnamdi Kanu, the leader of the Indigenous People of Biafra, IPOB, who has been in the custody of the Nigerian Army since 14th of September 2017 when the military invaded his house, killed over 38 IPOB members and kidnapped him together with his parents who as a sacred people are the current Eze(king) and Ugoeze(queen) of the ancient kingdom of Afara Ukwu Ibeku. It was a very brutal assault that led to the death of over 150 youths in and around Biafra land with the military pretending to be conducting Operation Python dance 2 in the region. These women were peacefully protesting against the way and manner the government of President Muhammadu Buhari is killing innocent people with impunity. These are women whose children and husbands have been brutally murdered by this evil regime of Muhammadu Buhari. These women have been raped in their farmlands by the Fulani herdsmen, these women are the ones that have lost hundreds of millions of Naira worth of agricultural crops to the ravaging cows belonging to the so-called Fulani herdsmen. They are the women whose cries for help, the government has constantly ignored. These women decided to exercise their fundamental human right to freedom of speech and association but were brutally molested, arrested and tortured for no other reason than the fact that they exercised their rights. I am terrified by the excesses of both the government and its security agencies. I am even more terrified by the complete death of conscience in our society. It is obvious that the government has mortgaged her conscience for want of power; the judiciary, military, and all other security personnel mortgaged their conscience for pecuniary gratifications. They all are today mere walking corpses, which must be the reason why somebody who is actually born of a woman would without hesitation crush a group of broken-hearted mothers simply because they said that the government should release their own son whom they have been unlawfully incarcerating for a very long time now. Nigerian police were so brutal on these mothers to the extent that many were severely wounded and were taken to the hospital; over 300 were arrested, detained and also taken to court for trial on very baseless charges as treason and so forth. The most annoying and of course highly disgraceful aspect of this senseless and barbaric act of the government and its agents is the refusal of the Court to grant them bail. The court has ruled that the innocent women numbering over 300 should be remanded in prison custody. Worst still is the inability of the prison officials to accommodate these women and as such all of them were kept outside, exposing these old women to heavy rain that falls on them and this definitely would expose them to the danger of ailments, diseases, and deaths. First, Rochas Okorocha is fully responsible for all these tragedies befalling our mothers because he is the governor of Imo state, as a result, the Chief Security Officer of Imo state. Nevertheless, the police and the army can no more say they are taking orders and as such should not be blamed, they are fully involved in this evil and must be held accountable for it. It is high time the world started intervening in the government's anti-democratic practices as well as human rights abuses that have become the order of the day here in Nigeria. The world leaders should, as a matter of urgency, prevail on the clueless president of Nigeria and his slave boy in the Imo State government House, Owerri, Rochas Okorocha to immediately release those women before it is too late because failure to do this would spell doom for this abominable entity called Nigeria.